Every year, when it's time for Halloween, I never feel very inspired to do something original. But with a bit of make-up you can make the coolest halloween looks, without even having to buy a whole costume. On Youtube found the most original looks, so I'm showing you my top 5 today. 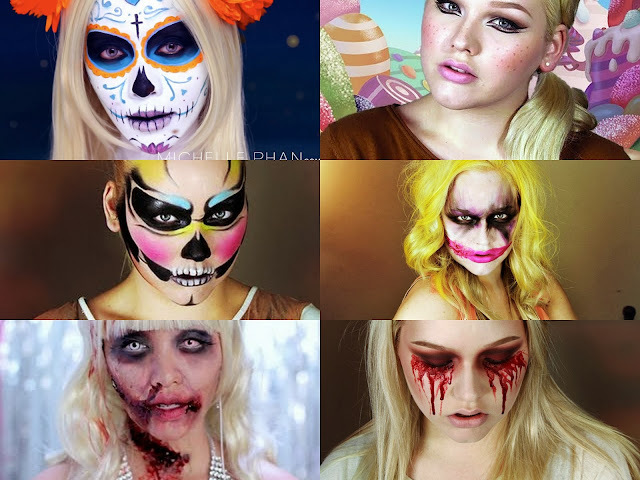 Nikkie is one of my favourite make-up artists on Youtube because she's so incredibly talented; she really does magic with make-up. Every year, she makes some amazing looks for Halloween, so keep an eye on her channel for new looks. The best Halloween look ever made! I'm not sure if I could re-create this but I wish I could. The pops of colour make is less ordinary. Bloody Mary, looks pretty easy. Female joker, original and not too difficult to re-create. Sugar skull. It doesn't look easy but the result is really cool. Sugar Skulls are becoming quite popular for Halloween looks so I'd give it a try. If you're trying to think of an original Halloween look for this year, just head over to Youtube, type in some keywords and you can find thousands of looks. Nothing's too crazy for Halloween!